Get ready for a new Alpha and Omega movie hitting the shelves on May 9th! 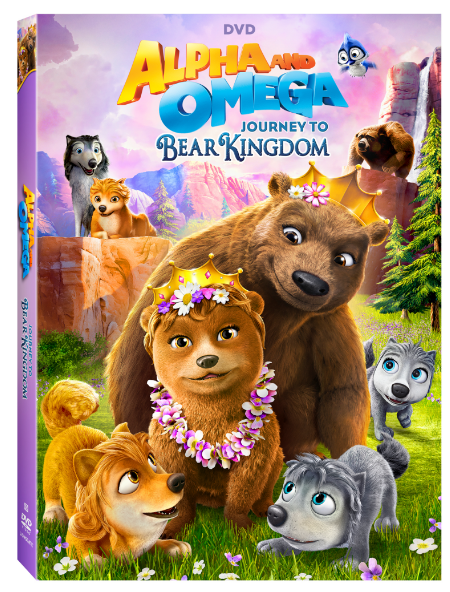 Get ready for an all-new animated adventure when the family film Alpha and Omega: Journey to Bear Kingdom arrives on DVD, Digital HD and On Demand May 9 from Lionsgate. The wolf pups Stinky, Claudette, and Runt must defend Bear Kingdom’s royalty and their forest home from the evil Rogue Wolves. With over three million DVDs of the animated series sold worldwide, the Alpha and Omega: Journey to Bear Kingdom DVD will be available for the suggested retail price of $14.98. The pack is back in a pawsitively thrilling adventure the whole family will love! All the animals in the Eastern Forest are excited because Queen Bear and Princess Canue are coming to visit. But when evil Rogue Wolves threaten the royal bears, wolf pups Stinky, Runt, and Claudette leap into action. With courage, wits, and plenty of help from their wild and wonderful friends, the alpha and omega wolves rise to protect the queen and princess and save their forest home.